The very first party I officially planned was for my niece, Lila's, two year birthday. 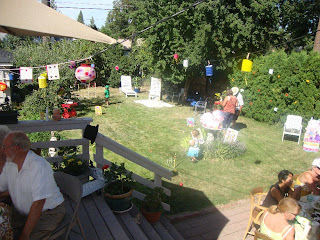 It was a "Wonderland" affair in my mother-in-law's quaint backyard. The party was such a fun theme to work with. I decided on a backyard tea party with lots of color, paper flowers and anything I could get my hands on that was reminiscent of the Disney favorite. With every event, there is of course constraints. For this particular birthday party, I had to work with three: a tight budget, planning from 300 miles away, and only a matter of a few hours to pull it all together. Fortunately, I had some secret weapons that made my job easier. My mother-in-law was one of them. She made food and found some fabulous gems second-hand to decorate with. The other was The Dollar Store. With a tight budget, one dollar goods and a bit of creativity went a long way. Her birthday was planned the same weekend we came to town for my baby shower, so we had a severely packed weekend of activities. Also, it was in the middle of August. 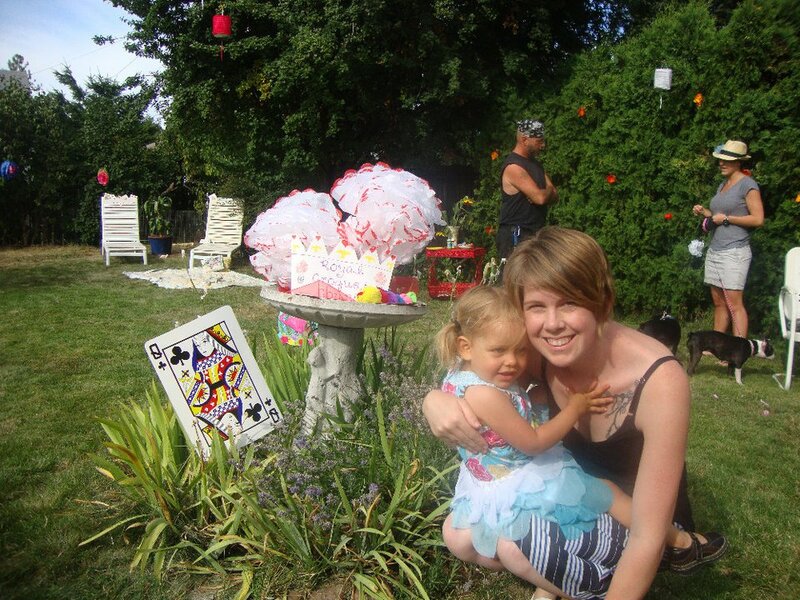 So picture me over 8 months prego hanging giant playing cards and paper lanterns in 90 degree heat. It was so worth it though! Lila loved it! I didn't take any pictures myself, so I had to gather snapshots from friends and family to show you the final product. Packaging paper and wooden dowels made for a good "wooden" sign to "Follow the white rabbit." I made a stencil of rabbit footprints and chalked a trail on the driveway for guests to follow them into the backyard. You entered the backyard through the garden where a giant stuffed white rabbit greeted you. Paper lanterns where strung across the yard and colorful paper flowers were tied to the trellis, bushes, and trees. 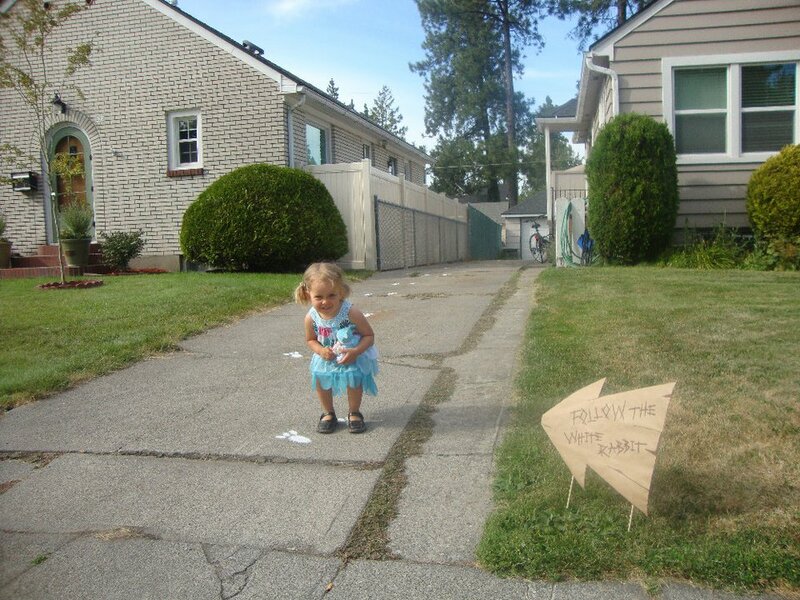 We repurposed red vintage end tables as stations where kids could grab silly string, bubbles, and sidewalk chalk. We set up lounge chairs and blankets with pillows for everyone to relax while others played games. The birdbath was the perfect place to set up our "Royal Croquet Court" sign. 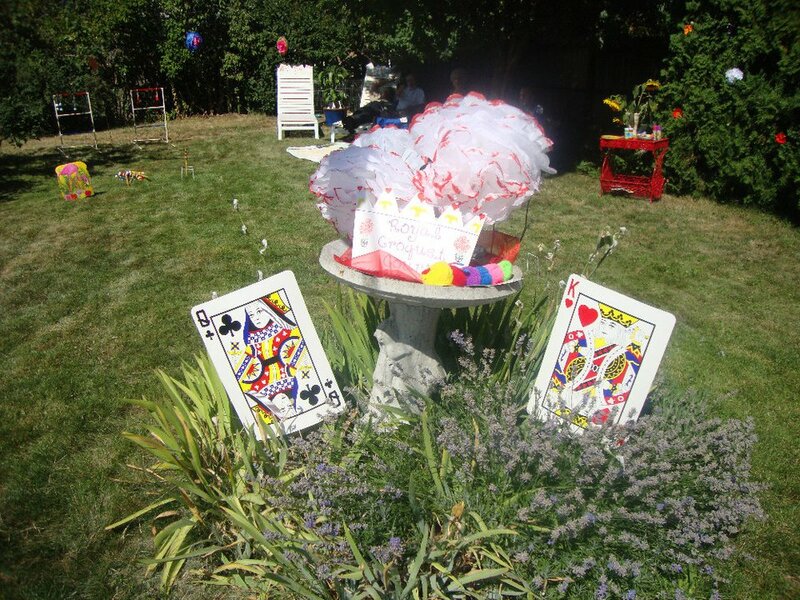 White paper flowers with red paint made our painted roses bush and giant playing cards guarded the croquet court set up with pink flamingos. Tea time was set up in the shade, thank God! 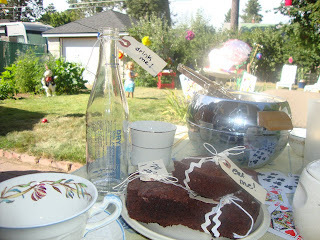 We ate little sandwiches (with crusts cut off, of course), brownies with "eat me" tags and sodas with "drink me" tags. A mixed assortment of china made for pretty, hodgepodge table settings. Lila had a great second birthday and even though time and resources were limited, the day was a success. With every event that I get to help with, I learn so much. I'm creating an arsenal of creative ideas, diy projects, and lessons learned to bring with me on future party planning adventures. Next up... maybe a Valentine's Day get together. We'll see, but I'm always ready to plan and party!